Vertical blinds are practical, durable and easy to clean. Ideal for sliding doors and large windows. 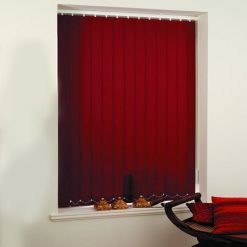 Available in slat widths of 90mm and 127mm, and comes in a large range of colours and textures. When Shopping at Blinds Direct Consider Vertical Blinds! With venetian blinds gaining popularity, the vertical blinds tend to be overlooked. 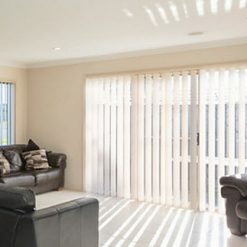 However these blinds are massively beneficial in many ways and may just be the perfect match for your specific window spaces. If you are not convinced yet, read on! The norm nowadays seems to be venetian blinds. 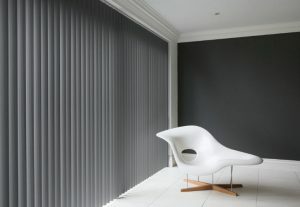 This is why when you have vertical blinds in your home or office people are kind of taken aback by the different look. They create a focal point without trying too hard just because they are slightly different. Because of their vertical inclination, they also often assist in making a space look higher and more spacious. It’s a trick that the long lines play on the eye. The materials, textures and colours that these blinds come in are endless! So whether you have a sleek and contemporary space or a more traditional and rustic décor theme; you are definitely going to find a style to suit and complement your surroundings. Plain white looks gorgeous in a modern home whilst pops of colour work wonderfully for the more eccentric soul. Whatever your style, these blinds can accommodate you. Not only this, but Blinds Direct provides a made to measure service which means that any window space is a breeze. The slats of these tend to be a lot thicker than venetian blind slats. What this means is that you are offered greater control when it comes to privacy and light. Vertical blinds cover more of your window which reduces the amount of amplified sunlight that shines through your windows and into your home or office. Sun can cause terrible damage to your flooring and furniture not to mention your skin! Yes, that’s right, you can still suffer the harmful effects of UV rays from inside. By protecting yourself and your furniture you really can save a lot of money. When it comes to sliding doors and windows that slide open, vertical blinds work a whole lot better than venetian. This is because they are more convenient to open and close allowing ease of access to your sliding doors and windows. With blinds that slide open and closed the same way that your doors and windows do, life becomes a whole lot easier. You would have to pull venetians up entirely for access.